Located on the third floor, on the luxurious Windsor Palms community, this three bedroom condo is situated just a few minutes from the US192 and a ten minute drive to the Disney theme parks. This condo is an ideal place for your family holiday. Queen-size bed, walk-in closet, TV. En-suite bathroom contains shower over bath, sink, WC. Double bed, slide closet, TV. Family bathroom contains shower over bath, sink, WC. Sitting on the third floor of a block of condos, this three bedroom condo is situated on the prestigious and splendid community of Windsor Palms in Kissimmee and is in an ideal location to reach Orlando’s main attractions. 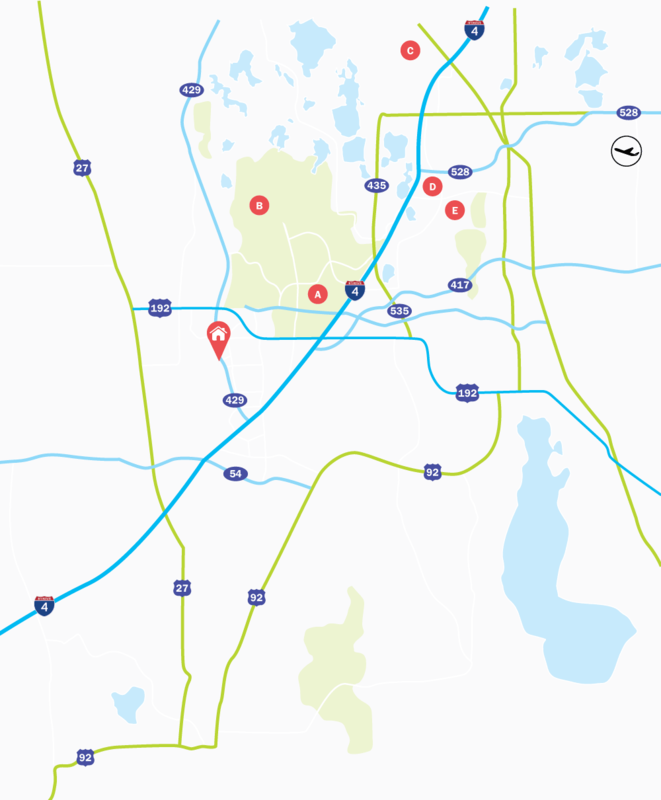 The US192 is just a few minutes drive away and Orlando’s most popular theme parks are no further than a twenty minute car journey. Living Accommodation - To the right of the front door is the open-plan kitchen overlooking the main living area of the condo. Continuing through the villa is the dining area with a table seating four people. Adjacent to the dining area is the family lounge with a loveseat and chair, a flatscreen TV with a DVD player and patio doors to the balcony. Bedrooms - The Master bedroom has a Queen-size bed and an en-suite bathroom. Bedroom 2 is to the right of the family lounge area and has a Queen-size bed. Bedroom 3 is next to bedroom 2 and has twin beds. Outdoor Living - The small balcony area has a small table and two chairs, perfect for relaxing and enjoying your time away. The gated community of Windsor Palms is pure five-star luxury. Stay in one of our villas or townhomes on this community, and use any of the amazing amenities free of charge, including clubhouse, cinema room, gym, Olympic-size swimming pool and tennis court. The popular US192 and Disney theme parks are just a couple of minutes drive away.